One of the many things I love about living in Bellingham is it's great sense of community. The people here are truly friendly and welcoming. There are several local magazines that highlight the folks of Fairhaven. These are glossy, well designed, thoughtful magazines whose sole purpose is to build community and create connections. In the latest issue of Southside Living (yes, we live on the south end of Bellingham) I am featured. Actually, my art work is featured. It didn't take long to feel like I belong here! Recently, I had the opportunity to create this garden inspired painting. A long time supporter and art lover invited me to his home to explore the possibility of a commissioned painting. He has a color-filled, creative and sacred space. His warm, beautiful kitchen is the heart of his home and opens up to an intimate deck filled with plants and flowers. It was easy to find inspiration there. He wanted to bring some of the outside in. 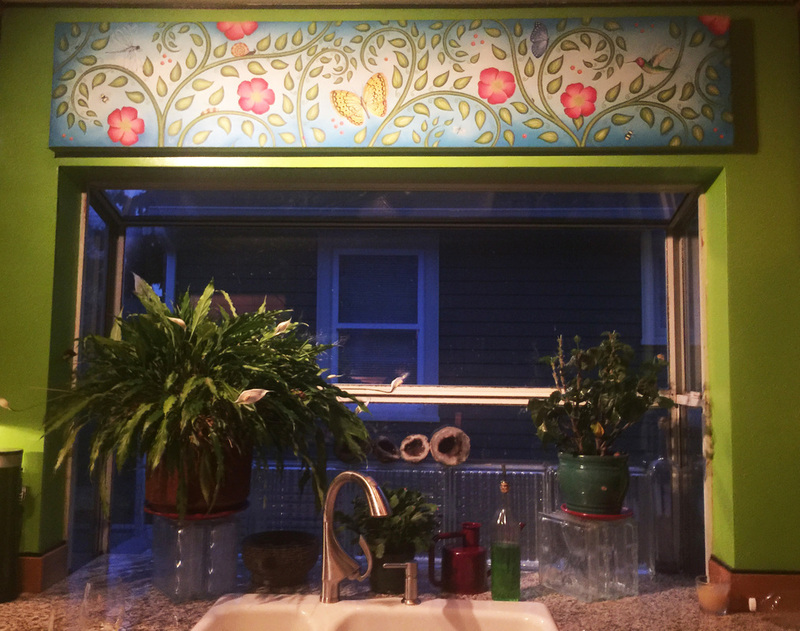 Above the window at his sink was an area of wall (the only available wall space in his house) that needed - yes, needed a piece of art. My only guidance was to create a piece that was 6 feet long by 14 inches high and celebrated the creatures and plants in his back yard. This is one of my favorite creative processes. How to take another's ideas and put them into an image that not only makes sense, but evokes a feeling and a story. I did some research to find insects and critters that would be found in the Pacific NW. Of course, I have used creative license to interpret each of them in my style. But, the beetles, butterflies, caterpillars, snails, bees, hummingbird, and dragonfly are all based on local residents. In my exploration, I was sad to learn of how many are on the endangered species list. I had fun placing creatures in obvious places as well as trying to hide others. I want it to be an invitation to enter in and spend some time looking. All and all, I believe there are 16-17 creatures in the painting. For me this was an exploration of the beauty of all things - especially at a time when many of earth's beings are being threatened. Even in the smallest area, there is more life than meets the eye. Isn't it said that God is in the details?! For me, this painting is a small celebration of life - seen and unseen, known and unknown. I love how it ended up feeling like his life-abundant deck. New works, happenings and other stuff!